Raspberry Pi enthusiasts that are looking for a weekend project to keep them busy may be interested in this infrared camera that has been built and is powered by the awesome Raspberry Pi mini PC. Building an infrared camera using the Pi PC allows you to take some very unique and spectacular imagery without the need to apply any further effects. 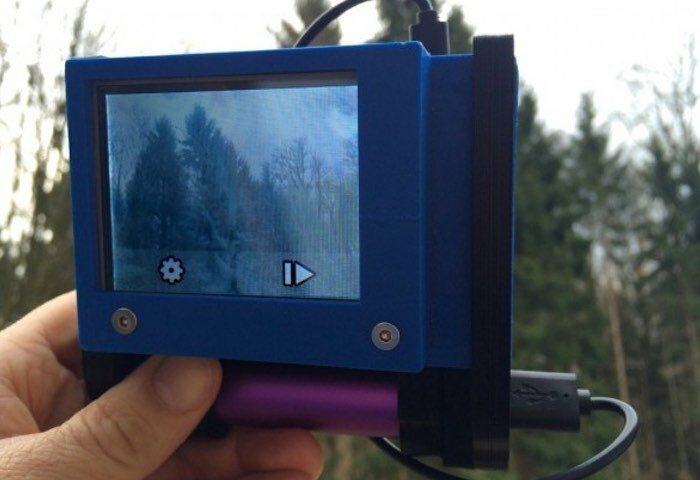 The developer of this Raspberry Pi infrared camera ‘willie42’, explains more about the inspiration, design and technology used. A year ago I read about a project, building an infradred-camera with a raspberry pi (Raspberry Pi Geek 01/2015). Although I hat different components – especially annother display, I got it to work at least. When I got an 3D-printer later, I became the chance to make a nice housing too. At that time the ir-cam was assembled in an old cigar-box 😉 I had a raspi B+ and the watterott touch display installed, so I needed to modify the lid of the portable case for my needs. Furthermore I had to change it in way, that I could attach (glue) the step-up-ring to the box in front of the cam and to hold/use the whole thing more than a normal camera. But before we go into details, some information about IR-photography: A normal digital cam has an ir-filter installed with the sensor. This filter removes the light above the visual spectrum from the photos, to make the colors look natural. But you all know those night-cams, that work with some IR-LEDs and – to humans – invisible light. Those cameras – and the NoIR camera module for the raspberry – don´t have that filter installed. So the ir-light, also part of the natural light, reaches the sensor too. This results in slightly “false” colors. To get the full effect, you now have to keep the most of the visual light out. Therefore you have to get a IR-filter which works the other way round, than the one described before. Now a lot of color is gone and – as most noticeable – the green of leaves and of grass appears white now, because the chlorophyl reflects most of the IR-light. With a cam like that, you can go for pictures with an unreal but fascinating look. To build your very own Raspberry Pi powered infrared camera following the links below for more information full instructions as well as all the files you need to create the 3D printer case.